The exhibition “They Arrived at the Ghetto... And Went into the Unknown...” presents various aspects and circumstances of the extermination of Polish and foreign Jews carried out within the framework of “Aktion Reinhardt.” 20 exhibition panels include historical commentaries that are richly illustrated with documents and archival photos. The exhibition of projects submitted to the competition on the architectural-landscape concept of the memorial on the area of the former German Nazi death camp in Sobibór. 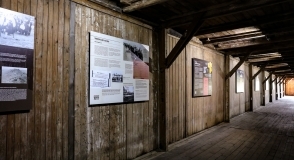 Open-air exhibition devoted to the history of the German death camp which was constructed in the Sobibór woods in 1942.